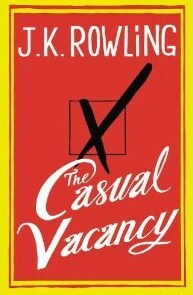 I think I am looking forward to The Casual Vacancy by J.K. Rowling, which will be released on September 27, 2012. "When Barry Fairweather dies unexpectedly in his early forties, the little town of Pagford is left in shock. Pagford is, seemingly, an English idyll, with a cobbled market square and an ancient abbey, but what lies behind the pretty façade is a town at war. Rich at war with poor, teenagers at war with their parents, wives at war with their husbands, teachers at war with their pupils…Pagford is not what it first seems. And the empty seat left by Barry on the parish council soon becomes the catalyst for the biggest war the town has yet seen. Who will triumph in an election fraught with passion, duplicity and unexpected revelations?" "Blackly comic, thought-provoking and constantly surprising, The Casual Vacancy is J.K. Rowling’s first novel for adults." Are you looking forward to reading The Casual Vacancy? Or do you plan on reading it at all? I don't really know what to expect with this book. I'm curious about it because it's J.K. Rowling, but it doesn't sounds like something I would usually want to read. I'll still probably read it just to see what it's all about. Great pick! Thanks for the comments you two! Your book choices look interesting as well! It doesn't sound like a book I'd normally read, but since it's J.K. Rowling I do want to give it a try (the synopsis actually reminds me of the movie Hot Fuzz haha). I definitely want to give this one a try, though probably not right away. I'll wait & see what others have to say. :) Great pick! It sounds like we all have our reservations with this one :-) It would be fun to discuss the book once some of us read it!